On Tuesday, February 3rd, the al-Furqan Media Institute, the official media outlet of the self-proclaimed Islamic State (IS) released a new video by the title Shifa’ al-sudur. Ali Fisher, Resident Data Scientist at the Centre for the Analysis of Social Media (CASM) at Demos and Nico Prucha, Research Fellow at the International Centre for the Study of Radicalisation (ICSR) at King’s College, analyse the extremist data flow and briefly some elements of the video to initiate a new series on Jihadica. Following a common and yet new modus operandi, the video was announced first as a forthcoming release on Tuesday morning via Twitter and released hours later. 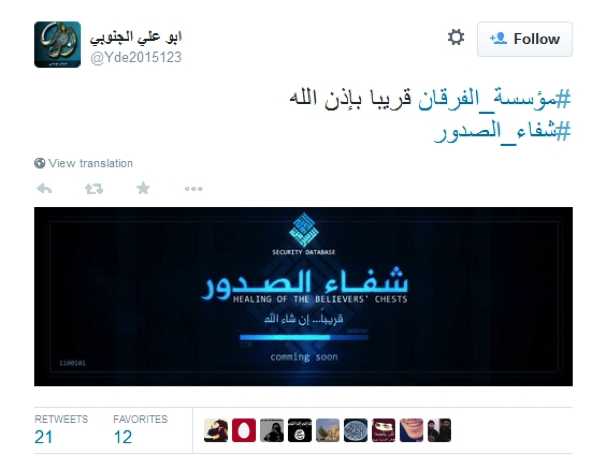 New jihad videos are oftentimes announced hours or days before actually being released. The first tweet, as described below, was published by a high profile account that is, however, not an official IS Twitter handle. The ‘official’ IS Twitter handles have been removed mostly and IS seems to have given up to open new accounts and instead further decentralises it’s spreading of information by simply resorting to specific hash tags and relying on trusted accounts and individuals within respective networks. 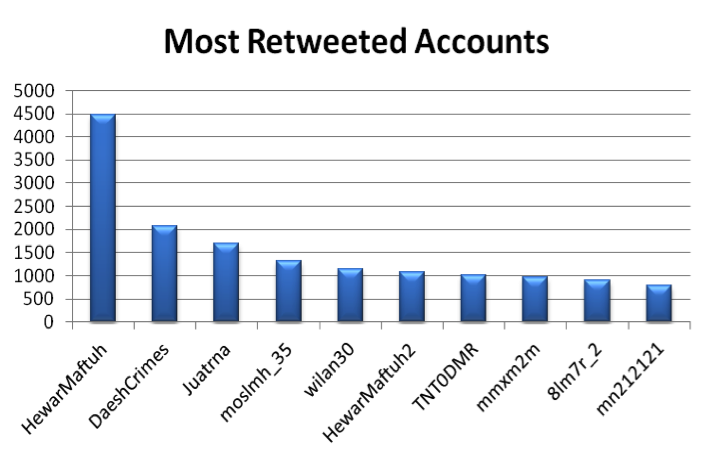 Unlike the release of Salil al-sawarim, part four that was published via Twitter using the – at the time – official wa-I’tasimu Twitter handle as shown in this graph made by Ali Fisher and then got picked up about 32k times by direct and indirect followers of this account, Shifa’ al-sudur endures simply by relying on its respective hash tags and fandom environments. The broadcast of the “Healing of the Believers’ Chests” (#شفاء_الصدور) as used in the English translation by al-Furqan media has provided another demonstration of the efficiency and effectiveness of the propaganda production and the distribution system via the Media Mujahedeen as recently detailed by Ali Fisher and Jamie Bartlett at Demos. 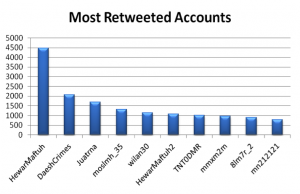 The distribution of the video shows that Twitter remains the beacon for the Jihadist social media zeitgeist. For those seeking to deliver counter-messaging, it is not enough to increase the volume, or even to be retweeted frequently; messaging must be able to penetrate the Jihadist clusters. If counter-messaging remains isolated, the result is less a counter message and more a separate conversation. As indicated by the banner, the video was released with embedded subtitles in English, French and Russian. The title of the film shifa’ al-sudur is a reference to the Qur’an and appears in an audio recitation By titling the video Shifa’ al-sudur, in reference to ninth sura, verse fourteen of the Qur’an, the jihadists seek to justify and empower the message as acting on behalf of God to “heal the believers’ feelings” according to the Qur’an translation by M.A.S. Abdel Haleem. This strategy is certainly not new and part of a coherent ideological framework of justifying various acts. Jihadist media productions, in particular videos, are part of this notion to “heal the believers” as a statement from the first generation AQAP in 2006 highlights (Arabic version with German translation and commentary is available here). The main part of the video consists of the captured pilot wearing the notorious orange jump suit explaining to the audience the details of his combat sortie on the IS capital of al-Raqqa and the general mission set up and armament. Jordan appears time and again within the jihadist media spectrum is a key ally in the outlined “war on Islam.” To underline this sentiment, the video opens with several sequences showing King Abdullah II pledging his full support to the international coalition against IS. Furthermore, sequences show Jordanian troops embedded with NATO forces in Afghanistan, a narrative that undermines the conviction of Jordan merely being a willing helper of western forces and hence part of the “crusaders”. Jordan’s involvement in Afghanistan was also the key element of AQ suicide bomber Humam al-Balawi (Abu Dujana al-Khurasani) who struck the forward operating base Chapman in December 2009, killing several American and Jordanian intelligence officers (details are available here). The captured Jordanian pilot Mu’adh al-Kasasba is framed likewise as an apostate (murtadd) who has forfeited his loyalty to God as a Muslim for serving King Abdullah II and is thus part of this crusader alliance, justifying his death within the brutal reasoning of an “eye for an eye”. Tweets carrying the name of the video in Arabic (#شفاء_الصدور) spread rapidly on the 3rd February carrying a banner announcing the imminent release of the video. The account of “Abu ‘Ali al-Junubi” has close to 7k followers and issued 1.4k tweets, mostly broadcasting IS-videos and news. The next 66,000 Tweets containing included 43,698 retweets, spreading news of the release or by those attempting to counter the message. 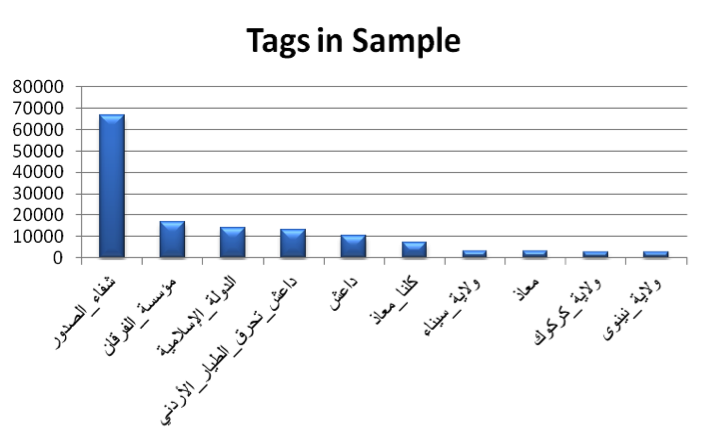 The other common tags in tweets containing #شفاء_الصدور hint at the other dominant messages which accompanied the release of the video. 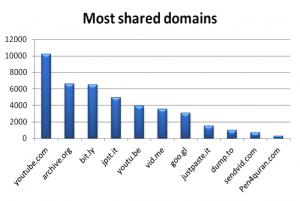 The most often used tag refers to Shifa’_al-sudur, followed by al-Furqan Media. Not surprisingly, the third hash tag references IS. The fourth and fifth hash tags reference “daesh” or “da’ish”, the Arabic acronym for ISIS that is widely used by non-IS activists and the mainstream media online. As a campaign emerged on Twitter in support of the captured pilot using the hash tag “we are all Mu’adh”, IS activists deliberately injected the video of his killing by using the same hash tag as well. The other three hash tags refer to self-proclaimed provinces or prefectures (wilaya) of the IS. The beheading of captured Egyptian soldiers on the Sinai by the local IS branch, operating in the “province of Sinai” uses the same hash tag following the same reasoning (here). The ‘success’ achieved by HewarMaftuh and DaeshCrimes of gaining large numbers of retweets can be misleading. 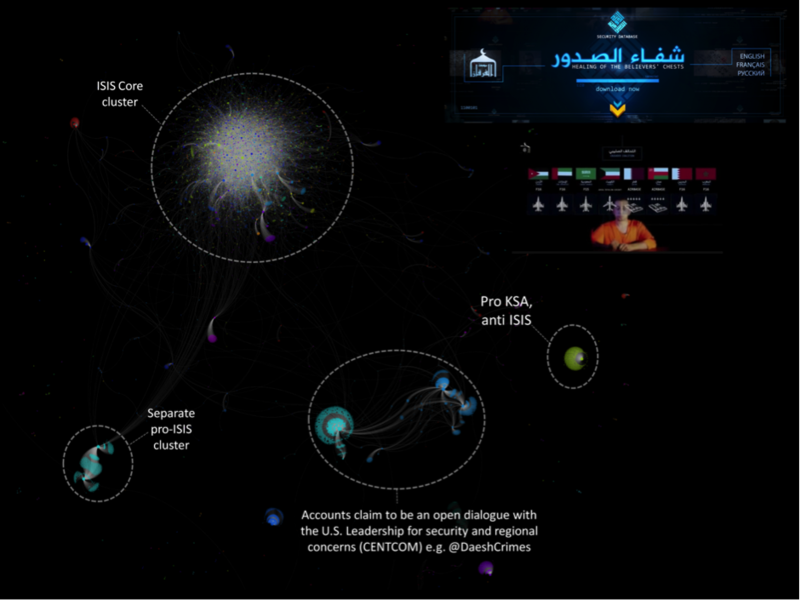 As the network image visually attests, those retweets were by an almost entirely isolated group of users who were not engaged by with the group of accounts actively disseminating the video. As observed with previous video releases, the content is part of a multiplatform zeitgeist. 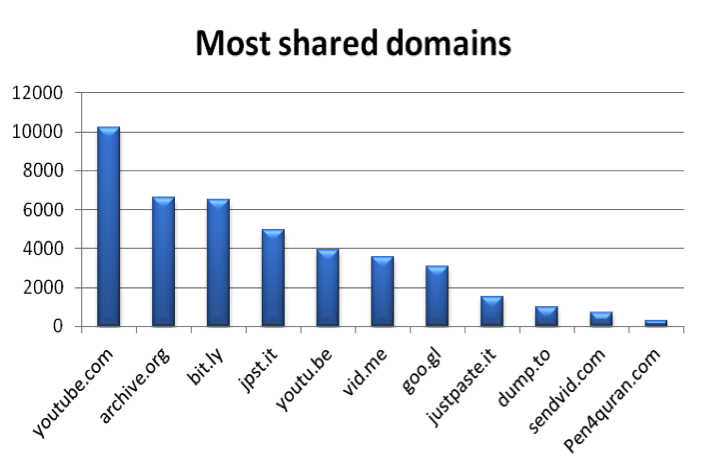 Other frequently shared platforms include YouTube, and JustPaste.it with the less common services such as vid.me, dump.to and sendvid providing additional resilience for the network.